Apply a leave-in conditioner to help close the cuticle. Brush it through to make sure it’s applied consistently. Then wrap everything to the right. Wrap brushing back and forth also helps with funky cowlicks. If your hair is curly and more resistant, this is the point where you would use a round brush to smooth out those curls. It’s very important that you don’t forget to flip upside down when blowdrying before flat ironing. Why? Because you don’t want the hair pasted down to your head! Always looks better to have the smallest amount of lift at the root. Go through and mist the hair with a heat-protecting spray. Personally, I like to mist the whole head, brush it through with a soft bristled brush, then go back and flat iron. That gives the heat protecting liquid time to soak in + dry. If you’re the type who likes to spray each section right before you flat iron, please be sure to let the spray dry before running the iron through. Run the flat iron through behind a soft bristled brush. Here’s the trick. 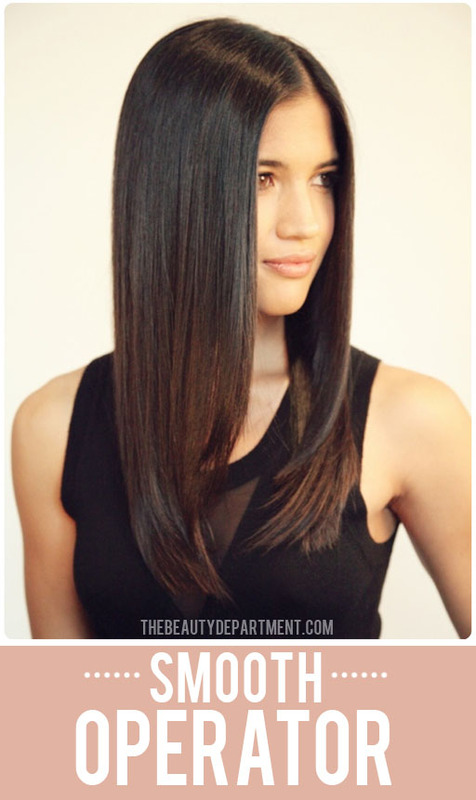 Right after the hair comes out of the flat iron, you’ll want to drape it over the brush as you see in photo 11. Let it cool for about 10 seconds and set it down. Once the hair cools with a little bend move to the next section.